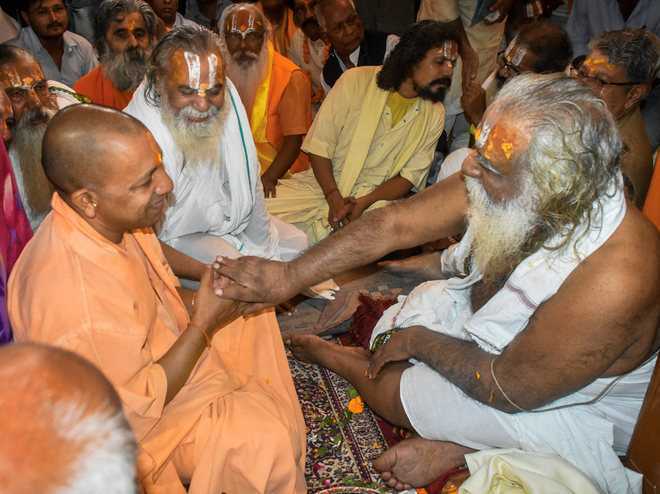 “In Ayodhya there was a temple, there is a temple and a temple will always remain there,” said CM Yogi Adityanath after paying obeisance at the makeshift Ram Lalla temple in Ayodhya on Diwali. A day after changing the name of Faizabad district to Ayodhya, the CM celebrated Diwali at the holy city. He said all options were open but he preferred a solution to the Ram Mandir-Babri Masjid dispute within the legal framework. Yogi said a grand statue of Lord Ram would be built in Ayodhya which would give the holy city a unique identity and also put it on the tourist map. “A search for appropriate land is on. Talks with architects have begun too,” he said. He clarified that the proposed statue was to be a tourist attraction and the one for worship would be raised inside Ram Mandir. He later visited Maniram Chavni, the seat of Mahant Nrityagopal Das, the acting president of Ramjanambhoomi Nyas, where he met a cross-section of saints as well as stakeholders such as Ramvilas Vedanti, who have been critical of the BJP government’s failure to construct Ram Mandir. Sources claimed the CM succeeded in placating them.